"I have 120,000 names in my file. I need to find all of the ancestors' names where a "note" (biography, or other) has been added. Obviously, not all of the 120,000 names have a note or notes. Is there an easy way to do this? I tried using the search feature, but I'm probably doing something wrong because it didn't work." Diane - you were really close. Yes, using Legacy's Search tool is where you want to be. You just have to use reverse thinking. Look at the image below (click to enlarge). It shows you what to enter for the search condition. Using the criteria as entered below, you will get a list of all individuals whose General Notes are not blank. In other words, you will get a list of everyone who has general notes. Below is what the Search list looks like. It is a list of just those persons who met the above criteria (everyone with general notes). Here you can click on the Notes tab to view each person's notes. The list can also be printed. Or, for more advanced users, you can "tag" everyone in this list for quick reference later. Hope this is what you were looking for Diane. Does your family tree have "Gaps of Unusual Size"? Most of us have them. If we could explain them or even get rid of them, we would have greater success in our family tree research. Unexplained gaps can be the reason for your family tree's brick wall. There are many kinds of gaps to look for. Some gaps can be explained, others cannot. If left unpursued, we may never uncover the "full truth" about the family. Below are some examples. All seems normal except for the 6-year-gap between the births of Samuel and William. As a rule of thumb, look for children to be born between 2-3 years apart. These "gaps of unusual size" deserve your attention and explanation. What accounts for this gap? Maybe there's a child (or two) that died young. There could certainly be two more children in this family born in 1837 and 1839. Since the 1840 census did not account for them, look in cemetery and other records for these potentially missing children. Who knows, these records may even provide additional clues to the family's ancestry. Maybe the family moved away between 1835 and 1841. Could they have had children in another town, and later returned? It is also possible that the father was gone for a time (military, a preaching circuit, etc.). If this is the case, then the gap between children is explained. What about the McCall family here? All looks pretty good until you notice the 8-year-gap between the 6th and 7th child. This actually is more common to have a gap between the second-to-last and last child. Here, David may have been a "surprise" to the parents, or, maybe we're missing children born in 1850, 1852, and 1854. Could these potentially missing children have clues to the family's puzzle? After a couple married, children usually came within the first year or two. In this example, David and Clara's first child came more than four years (1872) after their marriage (1868). Why? I don't know. Trouble getting pregnant? Before-their-time birth control? Maybe there's a missing child born in 1869 or 1870. Left unexplained, there's a chance that the family is not complete. In the Clark family below, the births of the first two children are suspicious. Maybe check the documentation for the births of these children? Were there other Nathaniel Clark families in the same region at the same time having children? Each of these suggestions deserve further investigation. Legacy Family Tree's Potential Problems report (Tools > Potential Problems) can expose many other gaps (see below). Browsing my family tree for gaps of unusual size was surprising. After years of being stumped on some families, identifying these gaps has given me renewed hope. Good luck to all in filling in your gaps! "My Legacy family file is on my home computer, but I want to take it with me on a laptop. Is it possible to copy my data AND my pictures to my laptop?" 1. With Legacy open on your main computer, go to File > Backup Family File. On the "Customize Backup" screen, make sure that there are checkmarks next to "Data Files" and "Multimedia Files". 2. Click on the "Select Name and Location for Data Backup" button and change the backup's location to the location of your removable media (USB drive, CD, etc.). After changing the location for the Data Files, Legacy will ask you if you want to set the Multimedia backup folder to be the same. Click "Yes". In this case, the family file's backup name is "Sample 2010-02-11 9.25.30 AM.zip". If you do not want the date and time as part of the backup's file name, turn off these options by clicking on the Options button. 3. Click on the "Backup" button. Legacy now compresses the data files and multimedia files. In the end, you will have two backup files that have ".zip" at the end of their file name. 4. Now we need to restore/extract these files on your laptop. With Legacy open on your laptop, and after inserting your portable media (USB drive, CD, etc.) into your laptop, go to File > Restore Family File and navigate to the drive where you saved the backups. Click on the backup file (the one without the word "multimedia" and click "Open". When asked to "Enter a name to restore the family file as" just leave everything as it is and click "Save". Your Legacy family file has now been "restored" to your laptop. 5. If you want the multimedia to also appear on your laptop you need to "extract" them. In Step 3, Legacy gathered all of the multimedia that you had linked to your family file and compressed them into a ".zip" file. Now you need to tell Windows where you will extract the pictures. If you've kept everything in c:\Legacy\Data, then just navigate to c:\ as shown in the image above and click "Extract". All done! Everything should now be on your laptop. Now you bring your laptop to the library, courthouse, or cemetery and hopefully add lots of new information. When you get home, follow all of the above steps to backup and restore the family file from the laptop to your main computer. We've got a busy couple of months ahead of us. We wish we could be all places at once (I guess we are trying - three separate events on February 26). We'd like to visit your genealogy society too. We often give Legacy classes or even full/half day seminars on genealogy technology topics. If you/your society is interested, let us know and we'll send details. If we're not personally visiting your city soon, there still may be a Legacy User Group meeting in your area. See http://www.legacyfamilytree.com/UsersGroups.asp for a list of user groups around the world. USA | California | San Luis Obispo - February 6, 2010. San Luis Obispo County Genealogical Society presents "Genealogy NOW: Photos, DNA, Documents, and the Internet". Visit with Dave Berdan (Legacy's president) and Geoff Rasmussen and get special seminar pricing on Legacy products. Geoff is teaching "Mapping and Timelines" and "Organizing, Planning, Mapping, Charting, and Sharing with Legacy". We're also giving away an Acer Netbook computer. Of course, you must be present to win. Held at Veteran's Hall, 801 Grand Avenue in San Luis Obispo. For registration and more information, please visit http://kcbx.net/~slogen/10seminar-sched.html. USA | Arizona | Sun City - February 13, 2010. West Valley Genealogical Society's annual seminar featuring Lloyd de Witt Bockstruck. Visit the Legacy table for seminar special pricing on Legacy products. Click here for more information. USA | Arizona | Scottsdale - February 16, 23 and March 2, 9. Four-week advanced hands-on Legacy workshop held at the Via Linda Senior Center's Computer Lab at 10440 East Via Linda in Scottsdale. 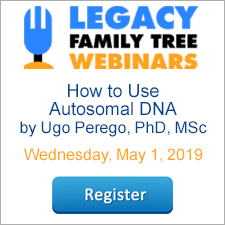 In this hands-on advanced workshop you will learn how to use the basic Legacy screens, SourceWriter for accurately citing sources, Research Guidance, report writing, mapping, charting, inserting pictures and documents and other Legacy features. Classes meet for 2 hours each week for 4 weeks. Cost is $40 for Scottsdale residents and $60 for non-residents. Call 480-312-7957 to register (course #78386). Contact Barbara Despenza for more information. USA | Arizona | Phoenix - February 23. Legacy-FamilySearch training for FHC staff and members of the Phoenix LDS Stake. Held at 3102 N 18th Ave in Phoenix at 7:00pm. The class will be an overview of working with Legacy 7.4 and its new FamilySearch interaction tools. Contact Gene Carruth for more information. Insider's Guide to Legacy Family Tree: Tips & Tricks. Click here for our speaking schedule. Click here for more information. USA | Utah | Highland - February 26-27, 2010. 13th Annual Family History Fair. Sponsored by the Highland, Highland East, Highland West, and Highland South LDS Stakes. Held at the Highland South Stake Center at 9600 North 6800 West in Highland. Friday schedule: 7:00pm to 9:00pm. Saturday schedule: 9:00am to 12:30pm. Leonard Plaizier will teach a class on Legacy Family Tree and will demonstrate the new FamilySearch features. Contact Lorie Stout for more information. USA | California | Whittier - February 27, 2010. Whittier Area Genealogical Society's 27th Annual Seminar featuring Paula Stuart-Warren. Visit us at the Legacy booth for the latest software and seminar-special pricing. Visit http://www.cagenweb.com/kr/wags/seminar.html for more information. USA | Utah | Bountiful - March 6, 2010. South Davis Regional Family History Fair. This has always been Utah's largest genealogy seminar. Please visit our Legacy booth for the latest software and special seminar pricing. Legacy's Geoff Rasmussen will be speaking on 1) Mapping Your Ancestors, Using the Latest Software and the Best Web Sites; 2) Research Guidence: FamilySearch, FamilySearch Wiki, GenSmarts and Legacy; 3) Legacy: Organize, Plan, Share, and publish with Legacy; 4) Legacy 7.4 and New FamilySearch. Click here for more information. USA | Arizona | Mesa - March 11, 2010. Mesa Regional Family History Center. 3:00-4:30pm. Legacy's Geoff Rasmussen will teach about using Legacy and its new FamilySearch software. Recommended for all levels of expertise, and especially for LDS Family History Center consultants. Held at the Olive building chapel located across the street south of the Mesa Temple (525 E. 2nd Ave in Mesa). We recommend that interested individuals call 480-964-1200 (FHC number) and register to attend so the Family History Center has advance indication of the number of attendees. USA | Utah | St. George - March 17/18/19, 2010. St. George Regional Family History Training Center located across the street from the St. George LDS temple. This is a 3-session Legacy class of two hours each day. 10:00am-12:00pm. In addition to the demonstration of how to use Legacy, students will also have hands-on practice along with assignments and handouts to best learn the software. Registration is limited, but is open to anyone. Contact David Midgley for more information. USA | Utah | Salt Lake City - March 18, 2010. Immigration Family History Expo. Visit with Legacy vice-president and developer, Ken McGinnis in booths 6 and 7. Share ideas, see our new FamilySearch software, and get great seminar-special pricing on our Legacy products. We're also giving away a free netbook computer as a grand prize. For more information, please click here. USA | Arizona | Youngtown - March 23/30, April 6/13. West Valley Genealogical Society. This is a four-week Beginning Legacy course taught by Legacy's Geoff Rasmussen. Pre-registration is required, and seating is limited. Visit http://www.azwvgs.org/Classes.htm for more information. USA | Washington | Burlington - March 23. Skagit Valley Genealogical Society. Legacy's Jim Terry will teach a class on using Legacy. 7:00-9:00pm at the Burlington Seniro Center, 1011 Greenleaf Avenue in Burlington. Contact Barbara Johnson (360-856-0870) for more information. The latest update to Legacy 7 was released Saturday. Its version number happens to be 7.4.0.6. As normal, this update contains enhancements and bug fixes. Also, as normal, this update is free. What's a little different about this update is that it contains a really big new feature that some genealogy circles have been wanting for a very long time. Other software programs charge for the features that we just released. 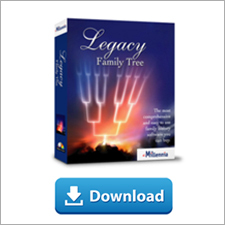 These FamilySearch features are free in Legacy. They are available in both the free Standard edition and the Deluxe edition. if you have already installed Legacy 7.0 (either the Standard or Deluxe edition), simply install the latest update as you usually would. For step-by-step instructions on how to do this, click here and scroll down to the "How to Update" section. If you have not yet installed Legacy, you can download the free Standard edition from here and you'll have the latest edition of our software (7.4.0.6). Or you can purchase the Deluxe edition from here and you'll also have the latest edition with the FamilySearch features. If you have any questions, you can 1) post a comment to this article (below), 2) write to our Support department, 3) call our Support department (425-788-0932), 4) send me a personal email. We'll do our best to respond as quickly as we can. Thanks everyone. It's been great to hear from so many of you.